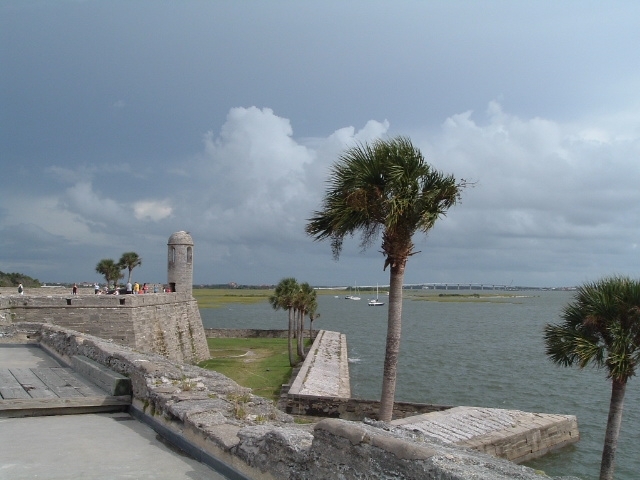 Indian Summer is an historical romance set in St. Augustine, Florida in 1739, a year before a major siege by the British. Gabriella Deza, the daughter of the Spanish governor, is fast approaching womanhood. Her fifteenth birthday looms on the horizon. She is completely taken by surprise when her father’s aide-de-camp, Manuel Enriques, declares his love and asks to accompany her to her birthday party. Manuel locked eyes with the next candidate for treading on my toes, who cowered under his look. Nodding rapidly, the little rabbit of a man retreated to the corner behind Clara and seemed to take her as his shield of defense. He bobbed his head rapidly again, retreating even further. He chuckled secretively as he turned me in a circle under his arm. “If need be, my dear. If need be. I shall have you to myself.” He put special emphasis on “shall” as he spun me again and the music began. Quiet at first, I listened with only half my attention. Suddenly, the orchestra erupted in a wave of the most exciting music I had ever heard! The guitars hammered loudly, the percussion began a beat I was familiar with. The music echoed the pounding of my heart. Manuel chuckled, seeing the surprised look upon my face. “Do you like my choice? It’s a special request I gave them. A dance just for us!” He spun me again, three times in succession. The music continued slowly, just a hint of notes on a single guitar. Manuel led me in a few gentle steps, ending in a deep dip. The tempo changed, accelerating into a fast, syncopated rhythm. He swept me into the most amazing dance! The music crashed into me in wave after wave of excitement. The power of it washed over us, setting my heart pounding in my chest with a beat at the same time unnatural, but as much a part of me as breathing. We spun, stepped, dipped, clapped, stomped and when we got to the end I realized I had just danced my first Flamenco. I had seen this dance many times. The country folk in Spain danced this at their celebrations. The music and tradition had followed us to this new land, where they danced it at festivals. Manuel led me off the dance floor, both of us a little breathless and perspiring. It was then I noticed no one else had joined us in the dance. I looked up at him with a question on my lips. He shrugged casually. I narrowed my eyes, feigning a glare. “How much did you threaten them?” I was teasing and he knew it. Our laughter filled the courtyard as the next dance began. The orchestra seemed rather let down after the Flamenco. I believe it had been the highlight of their evening as well as mine. “I need something to drink.” My throat was dry and scratchy and I felt hot all over. Manuel bowed, kissing my fingers, making his way to the punch. As rapidly as they could without being unseemly, my sisters rushed to my side. “Bella,” Maria chirped. “Where did you ever learn to dance like that! My goodness, I’ve never seen anyone dance the way the two of you did!” Their eyes glowed with happy envy. Irena didn’t speak, but she didn’t need to. Her blush from her cleavage to her hairline told me she felt the same way. “That was the naughtiest dance I’ve ever seen! And magnificent!” Irena’s eyes glittered. “I should feel as if I had lived a full life indeed, if only I could dance like that once! I don’t think Jason knows Flamenco.” She pouted, looking disappointed. I thought my sisters were about to come to blows, when Manuel approached us. He smiled warmly, extending a tray with three cups of punch. “Am I interrupting something, ladies? If so, I’ll take my leave.” He made as if to walk off. She was teasing, I hoped he would be able to tell. In reply, he caught her hand and spun her around under his arm. Then he lowered her into a dip that had her nearly horizontal to the floor! All this with one hand, for he still carried the tray and didn’t spill a drop! Raising her slowly, hardly seeming to strain with her weight, he locked eyes with her and his gaze burned into her soul.